The best paper for professional use. It has resistant surface, perfect cut and balanced absorption, allowing better paper sliding in the printer and avoiding ink waste. It is produced from the cultivation of 100% renewable Eucalyptus trees and fiber is treated to obtain the highest grade of whiteness. Chamex Office guarantees excellent performance in high speed equipment and printers. The test was carried out in labs at International Paper US. In that test, 10,000 sheets of paper are continually printed in high volume printers and 1 paper jam is acceptable at each 10,000 copies. Tests were carried out in multifunctional equipment with speed for 180 pages per minute. For excellent results, paper must be stored in proper place, with no humidity and excessive lighting, as well as with no malfunctions that can compromise the original manufacturing characteristics of the paper. Important: the quality of the paper influences in the printing process; however, the equipment components, maintenance and quality are also accountable. 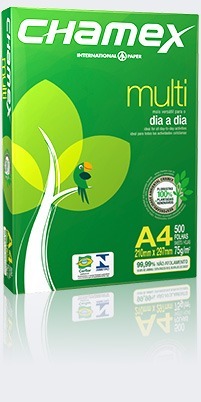 International Paper guarantees the paper quality in the printing process. Perfect for all everyday activities. 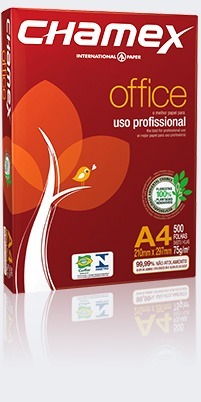 Guarantees great performance in every type of activity, such as writing, printing and reproducing. It has resistant surface, perfect cut and balanced absorption, allowing better paper sliding in the printer and avoiding ink waste. It is produced from the cultivation of 100% renewable Eucalyptus trees and fiber is treated to obtain the highest grade of whiteness. Chamex Multi guarantees excellent performance in high speed equipment and printers. The test was carried out in labs at International Paper US. In that test, 10,000 sheets of paper are continually printed in high volume printers and 1 paper jam is acceptable at each 10,000 copies. Tests were carried out in multifunctional equipment with speed for 180 pages per minute. Paper for high quality presentation. Its 90g/m² grammage results in a heavier paper, guaranteeing superiority. It has resistant surface, perfect cut and balanced absorption, allowing better paper sliding in the printer and avoiding ink waste. It is produced from the cultivation of 100% renewable Eucalyptus trees and fiber is treated to obtain the highest grade of whiteness. No limits to your creativity. Available in 5 color options: yellow, blue, ivory, pink and green, it is perfect for printing documents that require organization, highlight, fast visualization. Chamex Colors is manufactured from the cultivation of 100% renewable Eucalyptus trees, treated with special pigmentation, resulting in a more colorful and fun paper. The packaging is transparent to make it easier to see its shade. Made of renewable and recycled fiber. 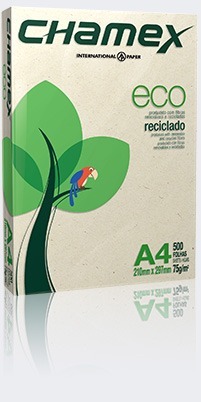 Made of renewable and recycled fiber, which ensures the distinct visual aspect and excellent printing results. The conscious choice is in selecting companies with policies that respect the environment and the society. White or recycled, Chamex line gets along with nature. Recycled paper in compliance with the ABNT standard NBR15755. The packaging is transparent to make it easier to see its shade. Perfect for activities at home or at school. 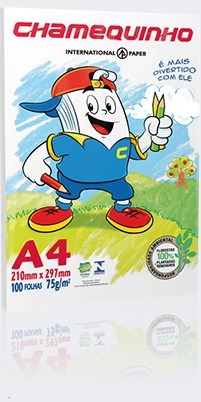 Perfect for everyday activities at home or at school, Chamequinho is a multiuse paper present when learning and having fun. Available in 100-sheet packages, with 6 options of colors: white, yellow, blue, green, ivory and pink. Open and close packaging. It is manufactured from the cultivation of 100% renewable Eucalyptus trees. 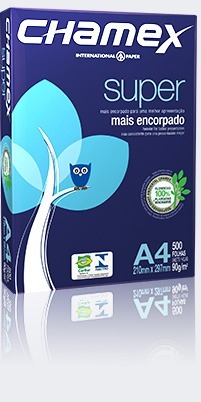 To access Chamequinho paper website, click here.